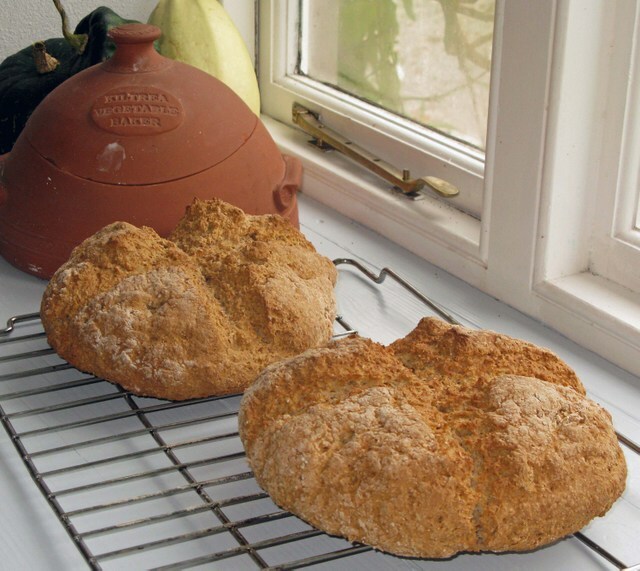 Soda bread only takes 2 or 3 minutes to make and 30 - 40 minutes to bake. It is certainly another of my 'great convertibles'. We have had the greatest fun experimenting with different variations and uses. It's also great with olives, sun dried tomatoes or caramelized onions added, so the possibilities are endless for the hitherto humble soda bread. sour milk or buttermilk to mix - 350-400ml (12-14fl oz) approx. Sieve the dry ingredients. Make a well in the centre. Pour most of the milk in at once. Using one hand, mix in the flour from the sides of the bowl, adding more milk if necessary. The dough should be softish, not too wet and sticky. When it all comes together, turn it out onto a well floured worked surface. WASH AND DRY YOUR HANDS. Tidy it up and flip over gently. Pat the dough into a round about 2.5cm (1 1/2 inches) deep and cut a cross on it to let the fairies out! Let the cuts go over the sides of the bread to make sure of this. Bake in a hot oven, 230ºC/450ºF/Gas Mark 8 for 15 minutes, then turn down the oven to 200ºC/400ºF/Gas Mark 6 for 30 minutes or until cooked. If you are in doubt, tap the bottom of the bread: if it is cooked it will sound hollow. Mix all the dry ingredients together in a large wide bowl, make a well in the centre and pour all of the sourmilk or buttermilk. Using one hand, stir in a full circle starting in the centre of the bowl working towards the outside of the bowl until all the flour is incorporated. The dough should be soft but not too wet and sticky. When it all comes together, a matter of seconds, turn it out onto a well-floured board (use wholemeal flour). WASH AND DRY YOUR HANDS. Roll around gently with floury hands for a second, just enough to tidy it up. Flip over and flatten slightly to about 5cm (2 inches) approx. Sprinkle a little flour onto a baking sheet and place the loaf on top of the flour. Mark with a deep cross and bake in the preheated oven 45 minutes approximately. (In some ovens it is necessary to turn the bread upside down on the baking sheet for 5-10 minutes before the end of baking) It will sound hollow when tapped. Cool on a wire rack.